James Valentine revels in being one of the "out-of-focus guys" on stage with his band, Maroon 5. The spotlight follows his heartthrob frontman Adam Levine everywhere, but that's just how James likes it. Ever the unassuming type, his melodic, tasteful playing is fuel for Maroon 5's hit-making machine. His riffs have formed the backbone of dozens of pop classics, and he uses his Berklee-honed chops allow him to seamlessly blend rock bombast with Chic-esque funk and Steely Dan-tastic jazz. Now, our friends at Ernie Ball Music man have honored his and his endless capacity for crafting ear worms by giving him a signature model guitar. Wildwoodians, we are proud to present you with the Valentine. James Valentine hates switching guitars during Maroon 5's stadium shows, which is totally understandable: with all the hubbub that comes along with playing for fifty thousand fans, the last thing you want to do is switch guitars every other song. So, James Valentine asked the folks at Ernie Ball Music Man to build him a guitar that he could play Maroon 5's whole set on. But, they had to do it without sacrificing simplicity or ease of use (again, no one wants to have to fiddle with five mini-toggle switches in front of 100,000 people clamoring to hear "She Will Be Loved"). 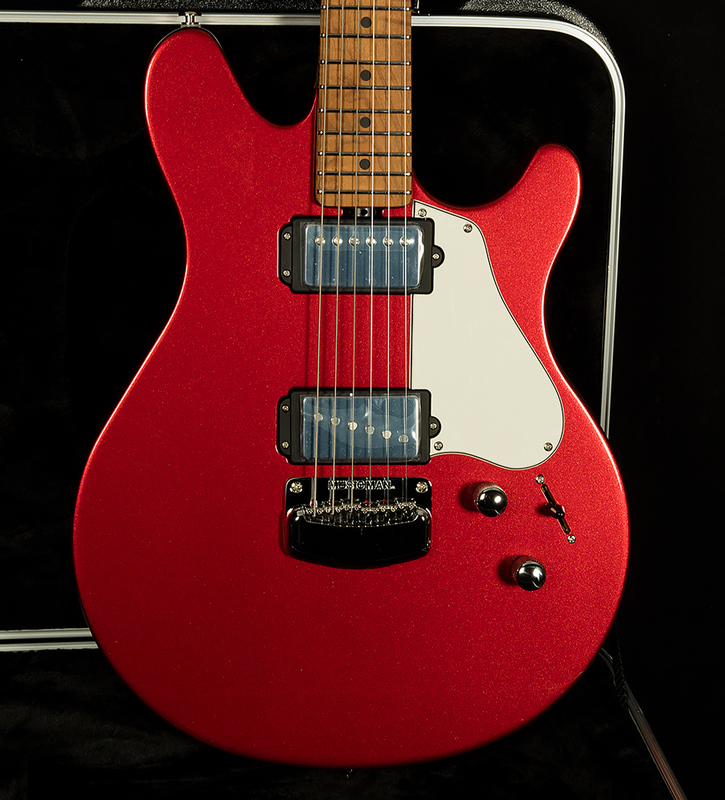 As a result, his signature guitar is supremely versatile even though it only has two knobs and a three-way switch. On the surface, the Valentine seems pretty basic: an offset-polepiece single-coil in the bridge position and a neck humbucker, a classic stadium-ready configuration favored by Keith Richards in his blackguard named Micawber. Even if those basic electronics were all the Valentine had to offer, it would still be a world-beater. The single-coil is crisp and snappy, with tight lows underneath punchy midrange and excellent chiming highs; in other words, the sort of sound that works in almost any context. 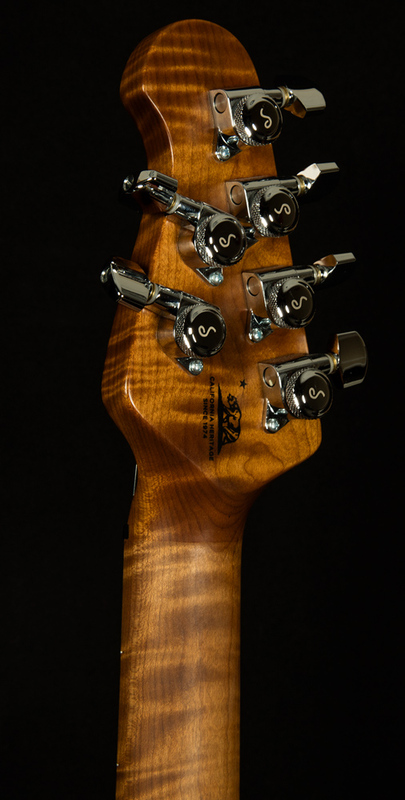 By contrast, the neck 'bucker is warm and woody, with vocal upper mids, tight lows, and singing highs (excellent for mellow jazz and thick riffs!). Both pickups sounds hi-fi and modern, but have enough vintage warmth to sound classic. With these two sounds, you could get through just about any gig! But, there is more going on here! Two push/push pots are what really unlock the James Valentine Signature's incredible versatility. The volume knob activates an adjustable active boost, which can go from mild, clean, transparent 5db to a roaring 22db! Basically, it can kick your amp into overdrive without a pedal. What makes this boost (which was inspired by the circuit on Steve Lukather's signature model) so amazing is how musical it sounds. Oftentimes, guitars with active circuits can sound a bit lifeless and sterile and lack dynamics. Not the case here! The Valentine remains touch-sensitive, clear, and pleasant even with the boost maxed out--it just makes the Valentine turn from Bruce Banner into the Incredible Hulk! You'll find the other push/push pot in the tone knob, which splits the coil for the neck humbucker. With the coil-tap engaged, you'll find plenty of warm, quacking tones in the neck position. More importantly, you'll find all the spanky Niles Rodgers-approved funk tones so crucial to Maroon 5's sound in the middle position. As a player, James Valentine rarely plays more notes than necessary. So, its fitting that a master of musical economy would help design a guitar that exemplifies the best parts of minimalist design philosophy. 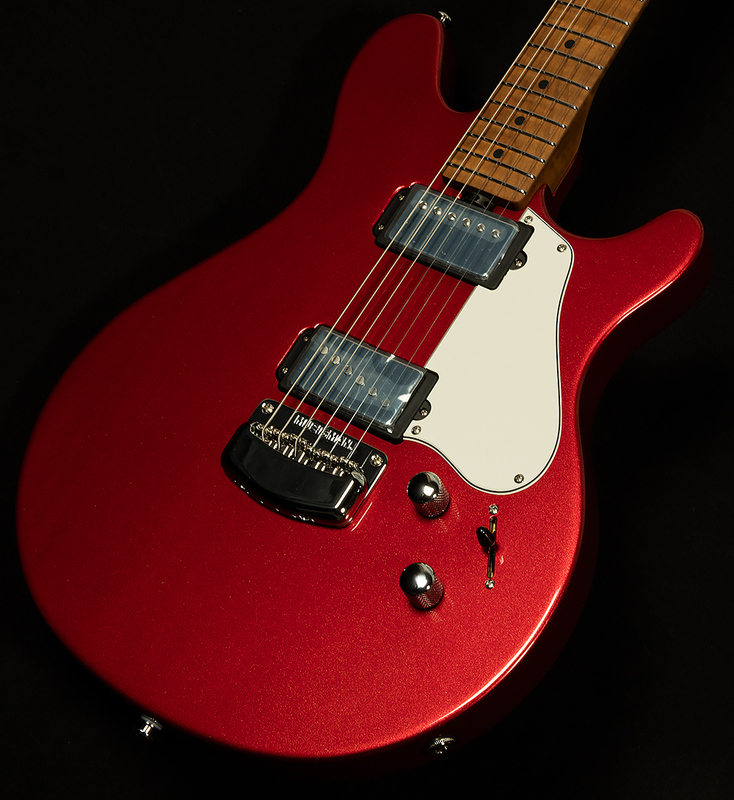 Its features a brand-new body shape that takes its inspiration from the Telecaster and the ES-335. They've merged these two American classics beautifully. As a result, the Valentine has a sleek, elegant, simple aesthetic that grabs the eyes and activates the salivary gland. Speaking of tactile delights, the body itself is deceptively simple. Though it may look like a regular slab of ash, it actually has a wedge-like taper. The top of the guitar is thinner, and the bottom is thicker. 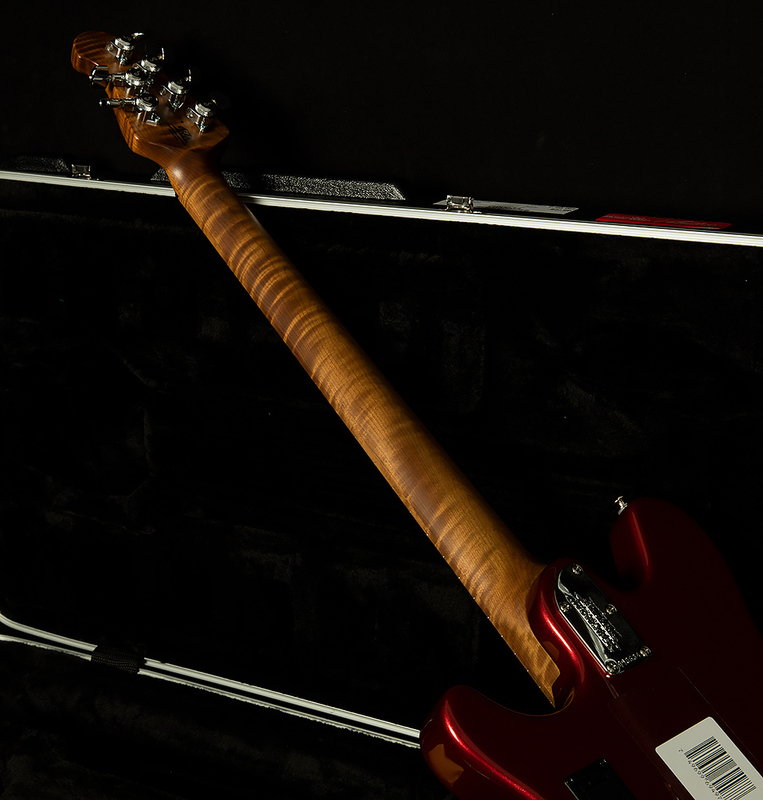 This reduces weight, and it also helps the guitar hug your body for a more comfortable playing experience without sacrificing the classic slab-body design. Speaking of comfort, let's talk about the glorious C-shaped neck profile! It's the sort of well-rounded shape that works well for just about any playing style. Ditto for the modern 10" radius and high-profile medium width frets (which are made of stainless steel, so they'll last forever). 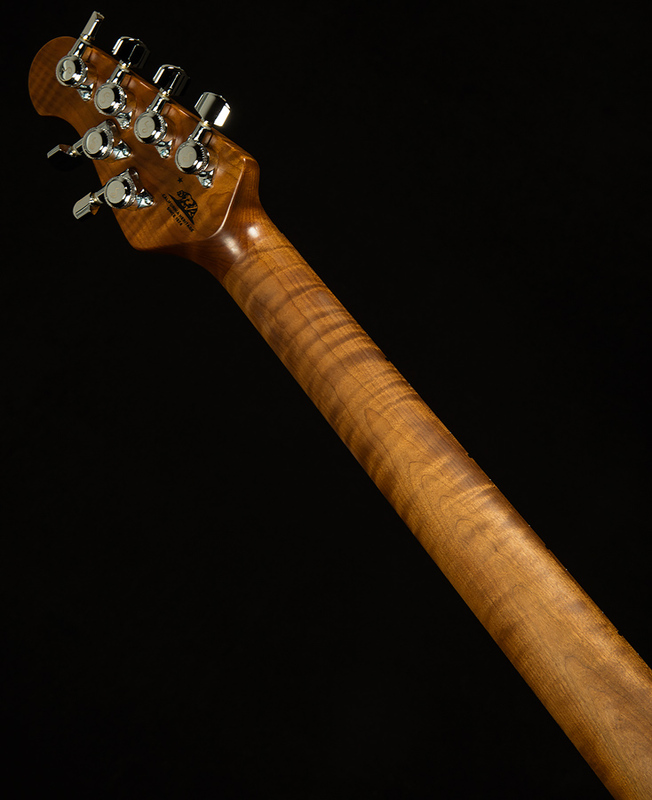 And, the neck is made of roasted maple, which means maximum consistency and stability. 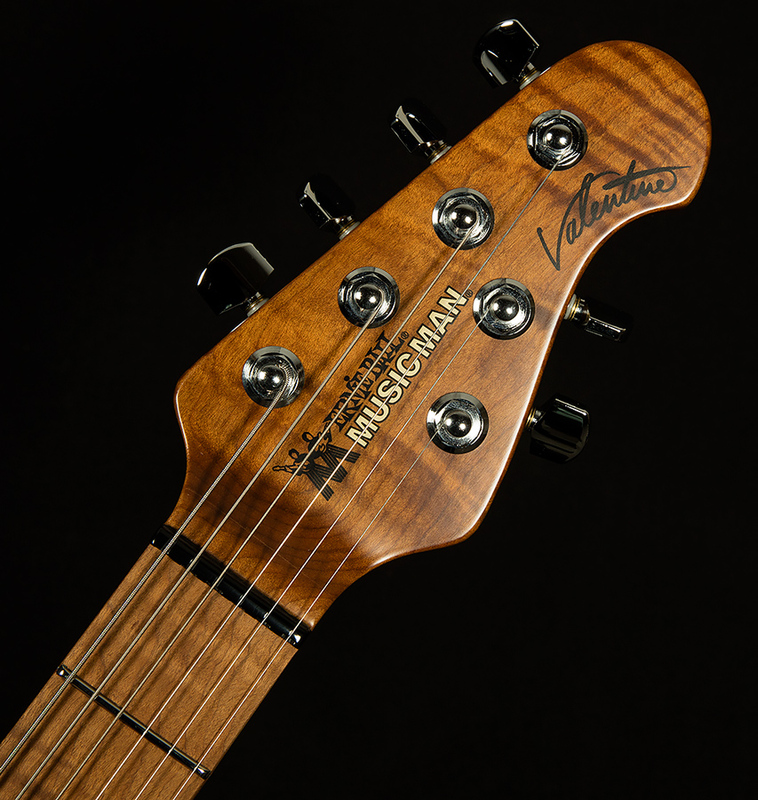 We're proud to showcase the Music Man Valentine for our exceptional customers. Its versatile electronics, gorgeous looks, and supreme playability will help you rock the stadium, the studio, or the bedroom with equal aplomb. We know it will bring endless inspiration on your six-string journey.